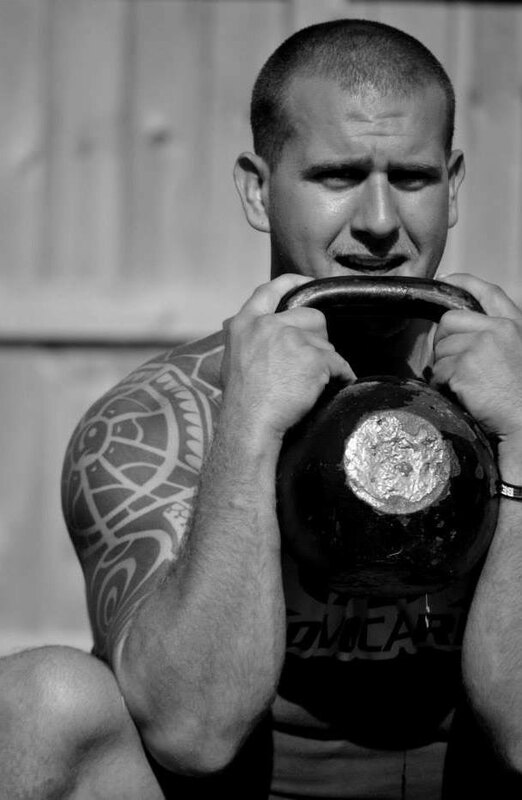 Matt Sillanpaa: In college, the strength and conditioning coach briefly introduced me to kettlebells. He had his CSCS and told me that kettlebells were good for conditioning. Other than knowing them as a conditioning tool, he didn't have a very deep understanding of how to use them. After I graduated and went into mainstream fitness, I realized that it's hard to simulate a college strength and conditioning room out in the "real world". I found that kettlebells allowed me to get as close to that as possible. This was before CrossFit, and kettlebells allowed me to work on strength, mobility, conditioning, and really put people through some aggressive stuff without having to have a ton of equipment. Dragon Door: Were you working on an exercise science related degree in college? Matt Sillanpaa: I have a Bachelor of Arts in health promotion, with a fitness management endorsement. While it was good degree, I would say my schooling was more focused on behavior change and the psychology of fitness. I had to learn kinesiology and biomechanics through the strength and conditioning department. I was also pretty fortunate because I worked at a big community gym part time while I was still in school. When I graduated in 2010, I was able to sign on at the gym full time. I ran some of the large group boot camp classes and pitched them the idea of kettlebells. I encouraged the gym owners to supply me with a big set of kettlebells because they were really starting to finally catch on in around 2010-2011. At first, I was pretty much self-taught through YouTube and I did a lot of research. 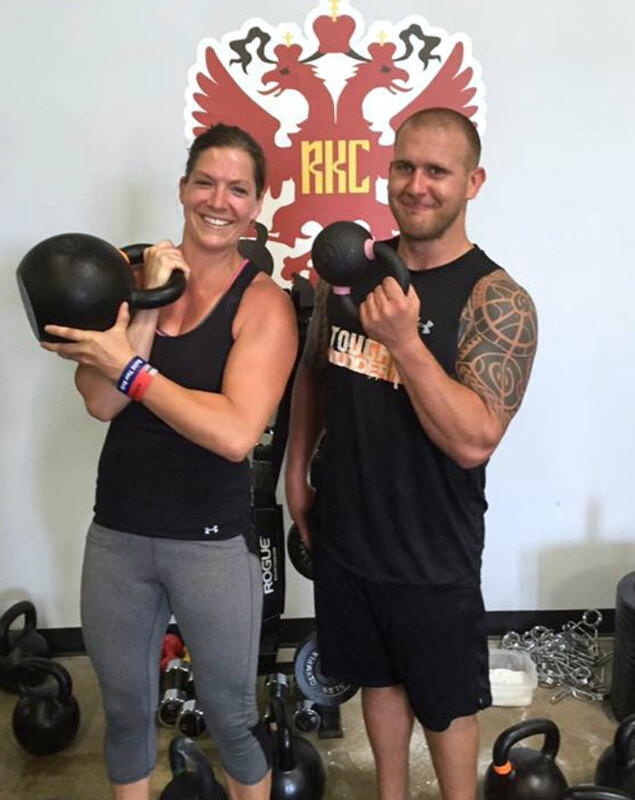 My wife, Julie, has been my learning partner since I started working with kettlebells in 2010. 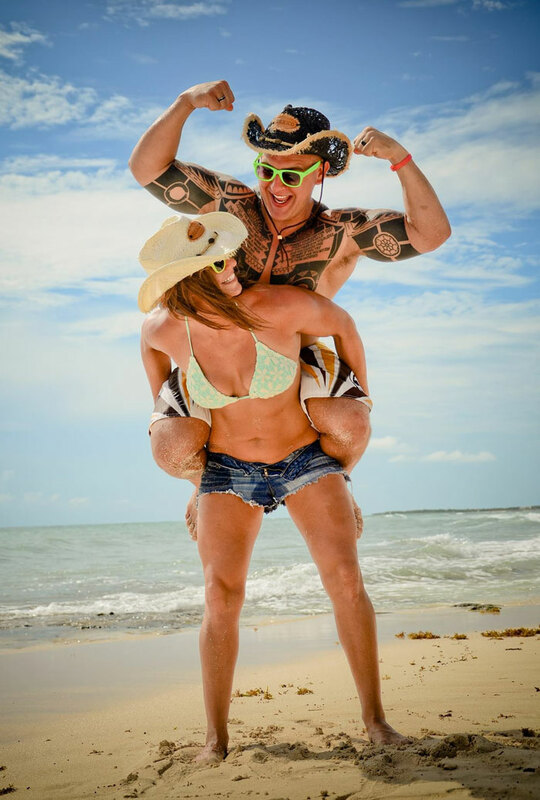 Every certification, fitness event, and business venture I’ve done has been a 50/50 effort with her. I think kettlebells have a lot to do with that. Their versatility allows us to craft our own personal workouts to our liking, while still being able to train side-by-side. It’s been a true blessing being able to learn in this industry with my spouse. 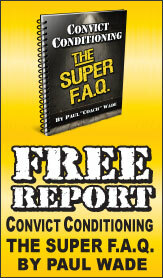 Dragon Door: When did you go for your RKC Certification? Matt Sillanpaa: I went to RKC workshop in the Spring of 2015. Dragon Door: Since the RKC certification can be a pretty big undertaking, how did you decide to go for it? Matt Sillanpaa: At the time, with personal training and large group classes, I had about eighty clients. We were basically learning together—I was really fortunate that my clients trusted me. I always told them I would do my best to educate myself, and I really grew along with my clientele. At first, I tried a group kettlebell fitness certification from another company, but it was laughable. Then I heard about RKC. When we finally opened our own place in 2014, we needed to set ourselves apart. We also wanted to make sure we were using kettlebells correctly and giving our clients the due diligence of learning the right way. Dragon Door: Before our interview, Andrea mentioned that some of the people you’ve trained also went with you to your first RKC. Are they now training clients at your gym as well? Matt Sillanpaa: Yes. Our gym is called Brickhouse Fitness, and we opened the first location in the spring of 2014 with a small training staff of four. It was myself, my wife, and two other guys who had been some of my first clients. One of them is in law enforcement and the other is in the Army. When I told them we were opening a gym they jumped on board. The four of us knew we needed to learn the curriculum together so that we would have a constant standard. We all need to speak the same language, and spread the same message. If Joe teaches a client or member something, and then I have them the next day, I’ll know that we’re not going to be sending mixed signals. After about 5 years, we moved into a new building and went from having 3,000 square feet to about 30,000 square feet! We’re still running about 25 kettlebell classes a week for large and small groups—and, we've expanded our training staff. The lady who came with us to the RKC this past weekend has been training with us as a gym member for six years, but now she's moved into a trainer role. When people come to our gym, they experience a technical coaching style that they'd never seen before and are sold immediately. Once they see it, it's hard for them to ignore! Matt Sillanpaa: Personally, my favorite kettlebell exercise to do is the figure-8. It's close between that and the swing, but I’ll choose the figure-8 because it includes some of the concepts of a swing. With the figure-8, you have to keep the kettlebell high on the backswing when you switch hands. And you hit all three planes in the movement. Athletes need to not only produce force, they also need to be able to absorb and redirect it. With the figure-8, re-racking the kettlebell up at the chest helps athletes—especially in contact sports—manage force and weight. My favorite exercise to teach is the Turkish get-up because it’s very in-depth and frustrating! You can tell a lot about someone whether or not they're willing to take the time to learn it. I can separate our entire membership or client base on one side of the room or the other just based on the Turkish get-up! You have to be kind of crazy to like the get-up! Kettlebells can give you a weird insight to people's lives. It’s almost a medium of—this might sound crazy to say—life coaching. But, if there's an idea or concept that I really want to get into somebody's brain, even a life lesson, I can often use a kettlebell to do that. Dragon Door: Who do you usually train? Do you have a particular demographic that comes to your gym? Matt Sillanpaa: We have a big mix, about 60% women and 40% men. Some are former athletes, military and law enforcement officers. We also train small business owners, teachers, nurses, and college students. We don’t follow the typical rules of group fitness with choreographed music and movements. We have coaches that program, demonstrate, and police the room for technique. I think our member base is diverse because our training staff is diverse, all with athletic, military, or law enforcement backgrounds. Dragon Door: You are hosting an upcoming HKC and RKC. What inspired you to host these workshops at your facility? Matt Sillanpaa: When I’ve found something that aligns with my beliefs and views in the exercise industry, I’ve really tried to immerse myself and share it. There is a lot of garbage out there, so when I find something I like and that makes a big impact on myself and my clients, I try to attach at the hip any way I can. Hosting a workshop and being around instructors who know more than I do—especially with how deep we are with kettlebell work—is a chance to learn even more. Dragon Door: Before our call, you mentioned having rugby practice. Do you find that kettlebell training has helped with rugby? Matt Sillanpaa: I was introduced to rugby in 2011 by client who was coaching a high school rugby team. He needed a strength and conditioning component, so I introduced him and the team to kettlebells early on. To date, they are the winning-most high school rugby program in the nation. They have 7 consecutive state championships, and their record is 98 wins, 3 draws and 2 losses. Early in their strength and conditioning training, we used kettlebells to build stability for tackling, bracing mechanics, and mental fortitude. We were able to break the players down so that we could find their weak points—then help them improve. Dragon Door: Are you currently working on or towards any particular goals in your training or for you gym right now? I feel fortunate that everyone I’ve I trained from the beginning understood that I was learning with them. It can be intimidating because if you’re the trainer or the coach, the perception is that you're supposed to know everything! I wanted to make sure we didn’t do anything unsafe, and I was constantly learning and trying new things. A lot of the success we've had can be attributed to the people who were willing to grow with us. Now, five of my coworkers I train with side by side every week were all once clients of mine! You never know where this will take you. I just wanted a new way to work out, now five years down the road I’ve found a new way to make a living. The directions it can take you are just endless! At our gym, kettlebells are the main tool we use and the RKC really made that evident. 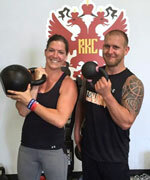 Matt Sillanpaa, CSCS, RKC manages BrickHouse Fitness with his wife, Julie. Contact them through their website at thebrickhousefitness.com. Follow them on Instagram brickhousefitness2018 and Facebook Facebook.com/brickfit.